LOS ANGELES â€“ The U.S. Environmental Protection Agency today notified Exide Technologies of federal violations at its Vernon, Calif. lead smelting facility. EPAâ€™s investigation, prompted by community concerns as well as ongoing investigations by state and local agencies, found that Exide violated the Clean Air Actâ€™s lead emissions standards on more than 30 occasions. EPAâ€™s investigation of the facility is ongoing. EPAâ€™s review of data collected from air quality monitors at locations on or around the facility showed average lead emissions above the federal standard from March 22 through April 19, 2014. In addition, excess emissions were monitored on or about September 9, 2013, September 18, 2013, and January 2 through January 3, 2014. Federal clean air laws require areas with unhealthy air develop a State Implementation Plan (SIP) to implement, achieve, and maintain EPAâ€™s air quality standards. Under Californiaâ€™s SIP, large lead-acid battery recycling facilities are prohibited from emitting lead into the air that exceeds 0.15Âµg/m3 (micrograms per meter cubed) over any period of 30 consecutive days. Any violation of the SIP is a violation of the federal Clean Air Act. Pursuant to todayâ€™s Notice of Violation, the facility has ten working days to respond to the violations. The Agency is evaluating its enforcement options against the company. Exide faces a penalty of up to $37,500 per day for each violation based on federal law. Exide Technologies is a battery recycling facility located at 2700 South Indiana Avenue in Vernon and has been in operation since 1922. Exide recovers lead from recycled automotive batteries and other lead-bearing scrap materials and recycles 23,000 to 41,000 batteries daily. The City of Vernon is an industrial city of 5.2 square miles located approximately two miles from homes and schools in the neighboring City of Maywood. The local South Coast Air Quality Management District is the lead agency responsible for enforcing rules and permit conditions to ensure that the facility operates in compliance with air pollution requirements, and has taken several enforcement actions against Exide for similar violations of air quality rules. Lead is a major environmental health hazard for young children and pregnant women. Exposure to lead can result in lowered intelligence, reading and learning disabilities, impaired hearing, reduced attention span, and hyperactivity. State officials shut down operations at Exide Technologies in Vernon, Calif. in April due to toxic air pollution that may pose health risks to members of the surrounding community. A troubled lead battery recycling facility in Vernon violated the Clean Air Act’s emissions standards on more than 30 occasions, according to a notice of violation released Thursday by U.S. Environmental Protection Agency. The EPA said Exide Technologies had violated federal laws by exceeding a 30-day average of emissions of more than 0.15 micrograms per cubic meter. In a letter addressed to Exide CEO Robert Caruso, Director of the Enforcement Division Kathleen Johnson wrote that the violations authorize the EPA to take several actions. The notice also states thatÂ Exide could face a penalty of up to $37,500 per day for each violation.Â The facility has remained closed since March and has laid off most of its employees. Exide did not respond to a request for comment. Exide has been the target of community furor since last spring when local air regulators found arsenic emissions had increased cancer risks for more than one hundred thousand people living and working nearby. The plant has been cited for numerous violations by the South Coast Air Quality Management District. Earlier this year, tests showed elevated levels of lead in the soil of homes near the plant. VERNON (CBSLA.com)Â â€” Officials announced Thursday that the Exide battery recycling plant in Vernon has emitted risky levels of lead into the air, violating federal limits and endangering nearby residentsâ€™ health. The U.S. Environmental Protection Agency found the facility surpassed federal Clean Air Act standards on more than 30 instances, between September 2013 and April 2014.
â€œEPA and the South Coast Air Quality Management District are working closely to ensure the company comes into compliance with state and federal law,â€ according to Jared Blumenfield, EPA regional administrator for the Pacific Southwest. Exide could face penalties of $37,500 per day for each violation, according to the EPA. Officials with Exide noted that the plant has been out of operation since March to undergo a series of upgrades. The plant has come under scrutiny this past year after testing found elevated levels of lead in the yards of 39 homes near the plant. The facility was forced to temporarily shut down last year due to arsenic emissions, and the AQMD sued the company in January alleging numerous air quality violations. 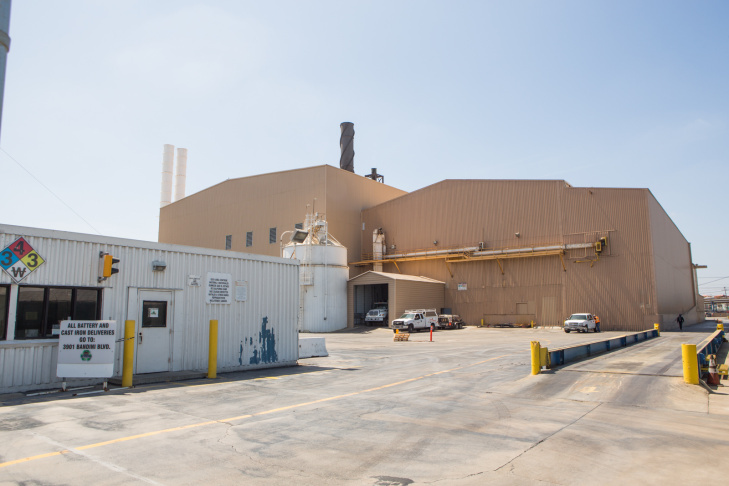 Exideâ€™s plant has been operating under a temporary permit from the state Department of Toxic Substances Control for the past 32 years and is the only facility left in the state that has not been fully permitted, DTSC officials said last year. In operation since 1922, the plant recycles 23,000 to 41,000 batteries daily. The firm at 2700 S. Indiana St. is one of only two lead-acid battery recycling plants west of the Rockies. Exide officials have blamed some of the elevated emissions recently on construction work to install upgraded equipment. The company has agreed to invest more than $5 million in the plant over the next two years, bringing the firmâ€™s total investment to more than $20 million since 2010, and reducing arsenic emissions by 95 percent. Â The U.S. Environmental Protection Agency this week accused a beleaguered Vernon battery recycler of repeatedly releasing too much lead into the air in violation of federal law. The Exide Technologies facility violated the federal Clean Air Act’s lead emissions standards on more than 30 occasions in recent months, according to a notice of violation released Thursday by the EPA. The plant, which has been a source of community outrage since regulators announced last year that its arsenic emissions posed a danger to more than 100,000 people, has been idle since March. Last month, Exide announced temporary layoffs of nearly all its employees. The South Coast Air Quality Management District already had cited Exide for the same excessive lead concentrations outside the plant that were cited by the EPA. The violations were on numerous days in September 2013 and January, March and April of this year. However, because the EPA approved those local air quality rules under the Clean Air Act, the federal agency has the authority to enforce them and did so this week, issuing its own violation notice against the company. “By releasing an illegal amount of lead into the air, Exide has put the health and well-being of nearby residents at risk,” said Jared Blumenfeld, the EPA’s regional administrator for the Pacific Southwest, in a statement. Although the federal agency has conducted inspections at the facility, this is the first time it has cited the battery recycler, said EPA spokeswoman Nahal Mogharabi. In a statement, Exide officials noted that the EPA had cited “past violations” and that the company is attempting to upgrade and reopen the facility. Exide is seeking approval from state and local regulators to move forward with upgrades. “The company is dedicated to investing the time and money needed to improve the Vernon facility so it can resume recycling more than 9 million batteries per year while complying with the strictest emissions standards in the nation,” said E.N. “Bud” DeSart, one of the company’s senior directors, in a statement. Exide has 10 days to respond to the EPA and may request a conference with the agency to present information related to the violations and efforts it has taken to address them, according to the notice of violation. The EPA could fine Exide up to $37,500 per day for each violation. The agency said its investigation of the facility was ongoing. State regulators have said California law requires Exide to clean the Vernon site even if it shuts down. U.S. Rep. Lucille Roybal-Allard (D-Downey), who represents Vernon and other communities affected by the plant, said in a statement that the EPA’s announcement bolstered her belief that the plant should remain shuttered. Times staff writer Tony Barboza contributed to this report. The U.S. Environmental Protection Agency has hitÂ Exide TechnologiesÂ with a notice of violation for air contamination at a California plant that serves as a cheap source of lead for its battery-making business. Operations were suspended at the Vernon, Calif., plant earlier this year, after Exide lost wrangles with state regulators. Now on its second trip through bankruptcy, Exide has said it is rewriting its business plan to provide for the possibility it will have to get by without the cheap lead from recycling operations at the Vernon plant. Earnings may drop from $15 million to $38 million annually if the Vernon facility remains offline and it is forced to buy lead in the open market, Exide warned. In the violation notice, issued Thursday, federal regulators invited Exide to talks that will allow the company to present evidence countering the agency’s findings that air around the plant is tainted with excess levels of lead. However, the finding by federal regulators comes on the heels of action by California regional air-quality regulators, which found lead contamination in the air were at unacceptable levels even though lead smelting had stopped. In its statement, Exide said it is engaged in ongoing talks with California’s Department of Toxic Substances Control and the South Coast Air Quality Management District “to make the necessary operational improvements and capital investments” to bring the Vernon plant in compliance. Exide could be hit with penalties of up to $37,500 a day, according to the EPA’s notice. It could also be barred from bidding on federal contracts. Not long before Exide sought Chapter 11 bankruptcy protection last June, the Vernon plant was ordered closed by regulators because of allegedly dangerous contamination. A state judge later reopened the facility, but it was taken out of production once again in March, because of new air-quality rules. Exide has set a July target date for filing the Chapter 11 plan that will set out how it plans to pay creditors. Environmental activists stage a protest outside Exide Technology’s battery-recycling plant in Vernon last month. On Thursday, the federal Environmental Protection Agency issued a report saying Exide violated federal lead emissions standards more than 30 times between April and September. VERNONÂ â€” The Exide battery-recycling plant in Vernon violated federal limits on lead emissions on more than 30 occasions between September and April, the U.S. Environmental Protection Agency announced Thursday. Clean Air Act standards on Sept. 9 and 18 of last year, Jan. 2-3 and from MarchÂ 22 through April 19. Two local congressional representatives issued statements in response to the EPAâ€™s actions. Rep. Lucille Roybal-Allard, D-Commerce, also issued a statement, saying â€œI am glad that the U.S. EPA has been monitoring Exide Technologies and is holding the company accountable to the standards of the Clean Air Act. â€¦ Todayâ€™s announcement by the U.S. EPA that Exide has violated the Clean Air Actâ€™s lead emissions standards on more than 30 occasions only strengthens my belief that this company should not be allowed to continue emitting pollutants into the air we breathe. â€œExide should stay closed until it can prove beyond any doubt that it will no longer emit harmful pollutants into our communities. I am confident today’s announcement is one more step toward a healthier Southeast community,â€ she added. The battery plant has been targeted by area air-quality regulators for more than a year. Testing earlier this year found elevated levels of lead in the yards of 39 homes near the plant. The plant was forced to temporarily shut down last year due to arsenic emissions, and the AQMD sued the company in January alleging numerous air quality violations. The battery recycling plant has been operating under a temporary permit from the state Department of Toxic Substances Control for the past 32 years and is the only facility left in the state that has not been fully permitted, department officials said last year. The firm atÂ 2700 S. Indiana St. is one of only two lead-acid battery recycling plants west of the Rockies. In operation since 1922, the plant recycles 23,000 to 41,000 batteries daily. Exide officials have said some recent elevated emissions were likely the result of construction work being done at the plant to install upgraded equipment. Company officials have said they have agreed to invest more than $5 million in the plant over the next two years, bringing the firmâ€™s total investment to more than $20 million since 2010, and reducing arsenic emissions by 95 percent.